Rotary evaporators (also called "rotavaps") are used to remove solvents from reaction mixtures and can accommodate volumes as large as 3 liters. They are found in almost every organic laboratory, since they allow performing this task very quickly. A typical rotary evaporator has a water bath that can be heated in either a metal container or crystallization dish. This keeps the solvent from freezing during the evaporation process. The solvent is removed under vacuum, is trapped by a condenser and is collected for easy reuse or disposal. Most labs use a simple water aspirator vacuum on their rotavaps, so a rotavap cannot be used for air and water-sensitive materials unless special precautions are taken i.e. additional traps are used. In the lab, the house vacuum line, a circulation bath or a membrane pump are used as source for the vacuum (40-50 torr). The fact that a vacuum is usually applied to the setup means that the boiling points of the solvents are going to be significantly lower than at ambient pressure (see table below). Since the flask is rotated during the evaporation process, the surface area is larger than normal which increases the evaporation rate significantly. The solvent is collected in a flask and can properly be disposed off afterwards (organic solvent waste). In addition, this method also avoids overheating of the target compound i.e. oxidation because lower temperatures are used. The same rules like for vacuum filtrations apply here in terms of the glassware and other precautions i.e no cracks on the flask, etc. 1. The solvent collection flask of the unit should always be emptied prior use to prevent accidentally mixing of incompatible chemicals. SAFETY FIRST! 2. 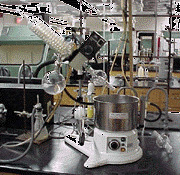 The flask with the solution is placed on the rotary evaporator. The use of a bump trap prevents the solution from accidentally splashing into the condenser (and being contaminated). It is highly advisable to start with a clean bump bulb in case something bumps over after all! This would allow the experimenter to recover the solution or solid. 3. A metal or Keck clip is used to secure the flask and the bump trap. The green one shown below fits 24/40 ground glass joints. Similar blue clips fit 19/22 joints and the yellow ones fit 14/20 joints, which will most likely used in the lab. If you break the bump trap, you will have to pay for it! 4. The dial on the motor is used for speed control of the flask rotation. A typical rotavap uses a variable speed sparkless induction motor that spins at 0-220 rpm and provides high constant torque. A good setting here is 7-8. 5. The aspirator vacuum is turned on. On most models, the vacuum on/off control is managed by turning a stopcock at the top of the condenser (left side of the above diagram). This stopcock is later also used to vent the setup after the solvent is removed. 6. The flask is lowered into the water bath (or the water bath is raised to immerse the flask in the warm water. (On most models, a convenient handle (with height locking mechanism) moves the entire condenser/motor/flask assembly up and down. Often the tilt of the condenser assembly can also be adjusted. The water bath temperature should not exceed the boiling point of the solvent!! For small amounts of common solvents the bath heater is not needed. 7. The solvent should start collecting on the condenser and drip into the receiving flask. Some solvents (such as diethyl ether or dichloromethane) are so volatile that they will also evaporate from the receiving flask and be discharged down the drain. To prevent this, a cooling bath on the receiver or (on some models) use a dry-ice condenser can be used. In addition, an additional trap (with dry-ice or liquid nitrogen) can be placed between the vacuum source and the condenser unit. This is particularly important of a membrane pump is used as vacuum source. 8. Once all the solvent evaporated (or whatever is desired at this point), the vacuum is released,. The flask is raised out of the water bath and the spinning is discontinued. 9. The bump trap has to be cleaned and the receiving flask is emptied upon completion of the evaporation. Distilled water should be used in the heating bath to minimize the scale build up in the bath which coats the thermistor and heating coils. It is very difficult to remove and reduces the efficiency of the bath. In addition, regular tap water will promote the growth of spectacularly disgusting algae colonies, particularly during the summer months. The best protocol is a regular exchange of the water. To remove algae gunk from the inside of a coiled water condenser, the condenser has to be removed from the rotavap and the coil is soaked in a dilute nitric acid solution for a few hours. After carefully rinsing the insides, the rotavap is reassembled. All standard safety precautions should be followed when working with nitric acid! The ground glass joint holding the flask does not need to be greased, but on rare occasions it (or the bump bulb) may get "frozen". Some companies sell special joint clips that can free frozen joints simply by screwing them in one direction. If you are not lucky enough to have these and cannot release the joint you probably want to ask your teaching assistant for advice. If a mechanical pump is used instead of an aspirator to produce a vacuum, a secondary trap has to be used to prevent that the solvent destroys the membrane or is absorbed in the oil.